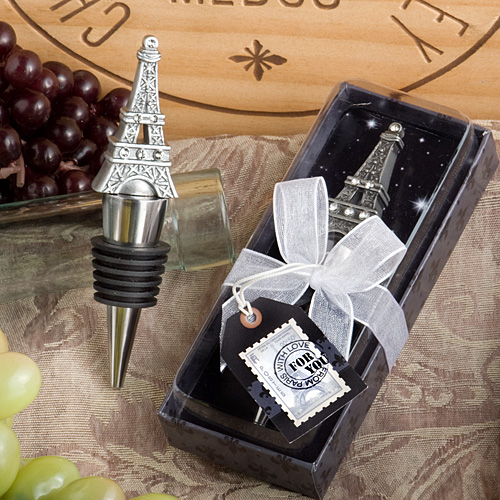 Eiffel Tower bottle stoppers make great French favors. Whether you are having a Paris theme party or just appreciate french design, these eiffel tower favors will be a big hit. Each wine bottle stopper favor measures 4 ?? x 1? and features a detailed pewter colored poly resin Eiffel Tower replica, enhanced with glistening rhinestones, atop a chrome finish silver metal conical base, wrapped with a black rubber gasket for a snug seal. Each comes resting against a starry night design insert background in a clear topped box with a black fleur de lis design charcoal grey base. The box is wrapped with a white organza ribbon and an attached Eiffel Tower postage stamp design ?For You? tag.